A hot dog (also known as a frankfurter, frank, wiener, or weenie) is a moist sausage of soft, even texture and flavor, often made from advanced meat recovery or meat slurry. Most types are fully cooked, cured or smoked. It is often placed hot in a special purpose soft, sliced hot dog bun. Left: A cooked hot dog sandwich garnished with mustard. It may be garnished with mustard, ketchup, onion, mayonnaise, relish, cheese, chili or sauerkraut. The flavor can be similar to a range of meat products from bland bologna to spicy German bockwurst varieties. Hot dogs made from a range of meats are on the market, but Kosher or Halal hot dogs must be made from beef, chicken or turkey. Vegetarian hot dogs made from meat analogue are available. Unlike other sausages which may be sold uncooked, hot dogs are always precooked before packaging. Hot dogs can be eaten without additional cooking, although they are usually warmed before serving. Since even the unopened packaged hot dog can have bacteria it is safer to reheat them. The term "dog" has been used as a synonym for sausage since 1884 and accusations that sausage makers used dog meat date to at least 1845. The word frankfurter comes from Frankfurt, Germany, where pork sausages served a bun similar to hot dogs originated. Wiener refers to Vienna, Austria, whose German name is "Wien", home to a sausage made of a mixture of pork and beef (cf. Hamburger, whose name also derives from a German-speaking city). Currently, hot dogs are one of the most famous fast food there is, with pizza slightly ahead. Throughout fairgrounds, parks and even holiday sites, hot dog stands have been seen in many places. Pork and beef are traditional meats. Less expensive hot dogs are primarily chicken or turkey, due to the low cost of mechanically separated poultry. 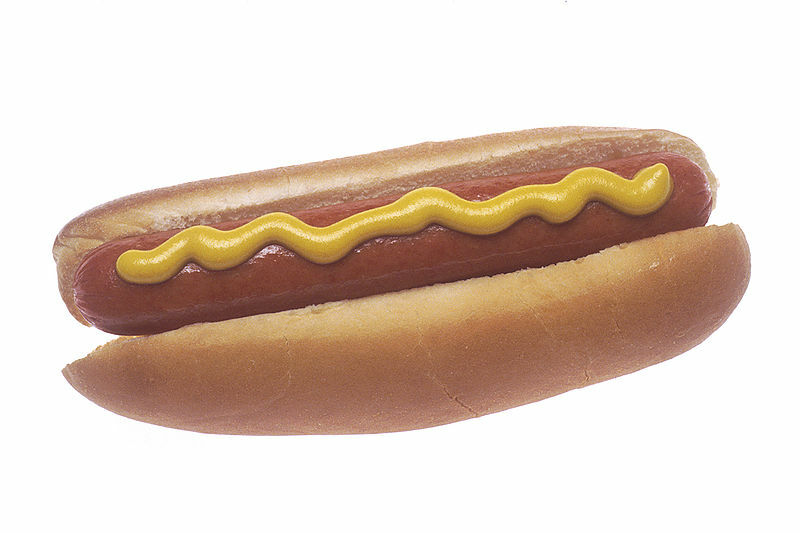 Hot dogs have high sodium, fat and nitrite content, ingredients linked to health problems. Due to changing dietary preferences, manufacturers have turned to turkey, chicken, or vegetarian meat substitutes, and lowered salt content. Common hot dog condiments include mustard, ketchup, pickle relish, cole slaw, sauerkraut, onion, mayonnaise, lettuce, tomato, cheese and chili peppers. They are served in a bun. Hot dogs may be grilled, steamed, boiled, barbecued, pan fried, deep fried, broiled, or microwaved. While hot dogs are cooked before packaging, they should not be eaten cold from the package. Hot dogs and their packaging fluid are sometimes contaminated with the bacterium Listeria monocytogenes, which causes listeriosis, a serious foodborne illness.